Let 2015 roll in like the ease of a wave. 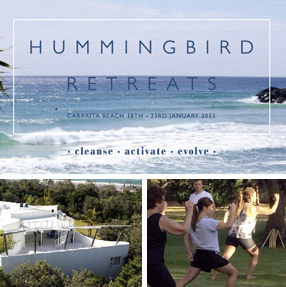 Hummingbird ocean retreat enables you to let go in one long slow exhale and activate your inner strength for the coming year. Blends of oriental medicine, taoist yoga and deep oceanic relaxation begin the dissolution of old patterns and welcome an evolved ‘you’ to the surface. Rise and shine to Qigong sessions at the land’s edge. Focusing on Jin Jing Gong (a fusion of breath, movement and meditation) to release disharmony and rejuvenate the body, mind and soul. Harness the power of your breath to replenish the energy within and support your circulation. Achieve the ultimate balance with daily acupuncture sessions complimented by an assortment of massage styles, including Remedial and Thai fusion by Anothai Soyyana. From external to internal, award-winning chef and nutritionist, Samantha Gowing nourishes with a menu of health infused meals for optimal glow. Experience expert yoga instruction with deep asana guidance or allow the vibrations of African acoustic musician Gareth Jones to shake you into being with an introductory evening to the sounds of Zimbabwe, Botswana and beyond. Swim, unwind, bike ride, beach walk, meditate and reconnect. Be immersed in the organic luxury that is Cabarita Ocean Health Retreat (20 minutes south of Coolangatta Airport). Dive into the elemental sanctuary of sun, sand, water and earth; in one of Australia’s most pristine and natural beachside locations. Follow up care is available with support classes at the clinic in Double Bay, held every Wednesday and Saturday or by appointment with Mark Phillips.